ALP Transport was established in 1991. We are a family business, owned and run by Peter and Suzanne Tod. 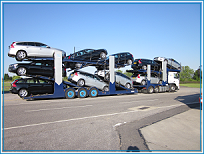 Our fleet of car transporters operate throughout the UK and we are members of the RHA. We pride ourselves on offering a 1st class service at a competitive price. This has resulted in us having a wide customer base, ranging from multi car franchises, auction houses and private customers, throughout the UK.